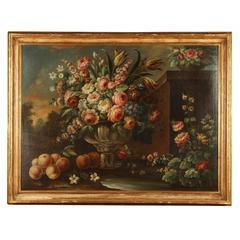 Pair of still lifes paintings with a composition of fruit and winged animals. 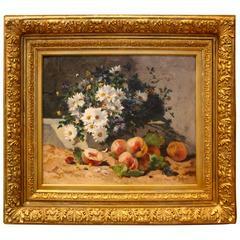 Beautiful canvases of the French artist Dubois, active in the 19th century in France. The two paintings have the original gilded frames. They underwent minor restorations as can be seen in the photos. Pair of armchairs in walnut wood with half-stitched fabric. Restoration style. 19th century French neoclassical lacquered pair of pharmacy bookcases. Made in pinewood. 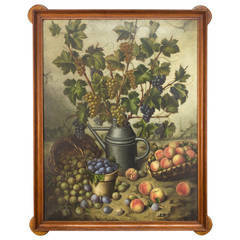 Restored with water painting and natural beeswax. Measures: cm 190 x 45 x 255 H each. 1880s Victorian chaise lounge carved in mahogany, upholstered in red velvet fabric. Fabric never used. 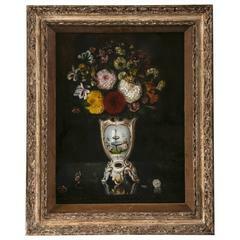 This pair are oil on canvas within distressed giltwood frames. Bouquets of flowers, in Victorian vases. Relined and with restorations unsigned.